Pontiac installed a variety of engines in Firebird and Trans Am models over their 11-year production run: everything from the anemic Chevrolet inline 6-cylinder all the way up to the powerhouse 400 Ram Air III and IV as well as 455 Super Duty engines. The 403-ci Oldsmobile engines were slotted inside these cars also. Firebirds and Trans Ams fitted with the special high-performance engines command the highest values, but certainly the more common Firebird and Trans Am V-8 cars are worth rebuilding. The engine is being moved into position for installation. This W72 400-ci engine has 9.5:1 and produces more than 350 hp at the rear wheels. Use care when moving the engine into position so you don’t damage any vital components or the firewall. When performing the work, it’s best to have someone move the engine hoist and lower the engine while another person steadies and guides the engine into position at the motor mounts. Pontiac made some of the best V-8 street engines from the muscle car era. Most V-8 engines in Firebirds and Trans Ams spooled out a lot of torque so they were ideally set up for street driving. And it was one of the reasons that Pontiac created such a well-rounded and fun driving package. 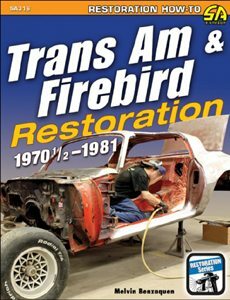 Most of the Firebirds being restored today are the performance versions of the Formula and Trans Am. Over the years, many different engines were slotted into the second-generation Pontiac F-Body. The early years saw only Pontiac engines in the 400- and 455-ci sizes. 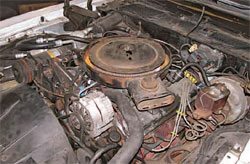 In 1977 the 403 Oldsmobile engine appeared, wheezing its 185 hp. Although technically a big-block engine, the 185 hp was about the same as a base engine in a Corvette. Coupled with a 2.56:1 rear axle ratio and weighing more than 3,800 pounds, it wasn’t much of a stoplight performer! The 301 light-cast engine was introduced as an effort to increase the fuel economy standards. The turbo version of the 301 was introduced in 1980 after the 400 was discontinued in 1979. 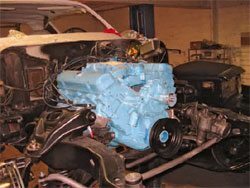 The 305 Chevrolet engine was made available in 1980 and 1981 as a performance engine. With a long oil fill neck in front of it, the Oldsmobile engine is easily identifiable. 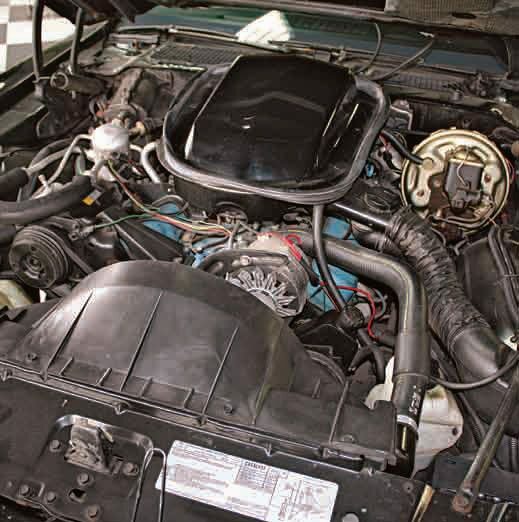 This 1979 Trans Am engine compartment contains an optional L37 301-ciV-8. If you wanted a 4-speed manual transmission, you had to get the L37 or the 400-ci engine. The 301 was a credit option, and that means you received a deduction (or credit) off the sticker price for ordering it. In 1979, Pontiac produced 1,530 Trans Ams with the L37 301 engine, 4-speed, and T-Top CC1 option. Originally, the factory labeled the shaker as a T/A 6.6 when equipped with the Pontiac 400 engine, and when equipped with the 403 Oldsmobile engine, the shaker received a 6.6 Litre decal. Over the years, the replacement decals were changed so you cannot believe the shaker callout. The VIN designation of K is the 403 Oldsmobile engine while Z designates the 400 Pontiac engine. 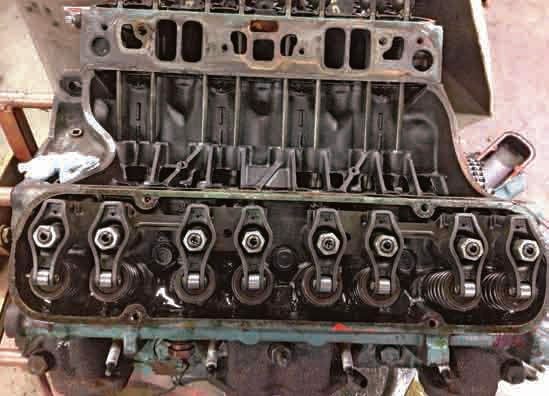 Rebuilding an Oldsmobile engine versus rebuilding a Pontiac engine is not really that different as far as a machine shop is concerned. 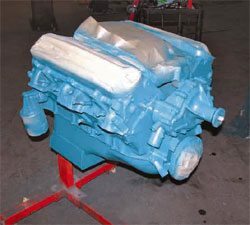 There are no real differences whether you are rebuilding a Ram Air III, IV, SD 455, or base 400 engine. Rebuild kits are available from most performance retailers, including Jegs or Summit Racing. Rebuilding the 301 Turbo is difficult as hardly any parts are available. Performance upgrade parts are almost nonexistent. Rebuild kits for the 301 and the 301 Turbo are difficult to find, if you can find them at all. Squeezing performance out of the 403 is certainly possible. Mondello Performance sells the necessary parts to wake up the 403 and make it run like some of its 455 cousins did back in the day. Bear in mind that all of the engines during the Firebird’s run can benefit from port matching, carburetor tuning, distributor advance, and exhaust sizing improvements. This is true whether you have a Pontiac 301, 400, 455, SD 455, Chevrolet 305, or even an Oldsmobile 403. Even more gains can be made if keeping the stock appearance under the hood is not the priority. Numerous performance parts are available for the Pontiac engines (except the 301), Oldsmobile, and, as you probably are well aware, the Chevrolet engine. The 455 Oldsmobile engine bolts in right in place of the 403; the 350 Chevrolet engine bolts in right in where the 305 resides. By 1981, performance was all but gone. The Trans Am and the Corvette were the top contenders when you looked at performance numbers. The second-generation Firebird was still portly and Pontiac’s attempts at weight loss were not working out too well. By comparison, the four-door Bonneville weighed 100 pounds less in 1981. Many Pontiac engines have lived demanding and less-than-ideal lives. Whether because of abuse, neglect, or internal component failure, many Firebirds and Trans Ams do not have their original engines. Some engines were yanked in favor of service replacement blocks, but you can’t simply assume that your car has its original block. You need to identify the engine so you can formulate a rebuild plan. Each engine has certain individual aspects that are different and need to be taken into account. For example, look at the rear edge of the block to locate the block casting number. 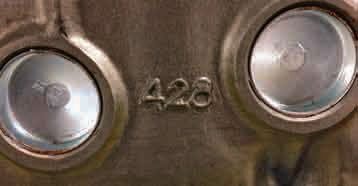 The date code for the Pontiac V-8s is found at the back of the block near the driver-side cylinder bank and distributor hole. The block casting number is found behind the passenger-side cylinder bank at the rear of the block. All engines installed in the Firebird have a block code. The block code tells you the engine and application. You cannot, however, let these codes be the sole determining factor as to whether you have the correct engine in your Firebird. These codes were reused every year. For example, a 1970 YZ code is a 400-ci Ram Air III 345-hp engine, but in 1972 the YZ code designated a 400-ci 2-barrel 200-hp engine. Definitely a big difference! Deciphering a Pontiac engine means you need to look at several numbers. The casting number is on the passenger’s side of the block, on the back side. The date code and last two numbers of the year are near the distributor opening. The block code is on the front, below the passenger’s side of the head. The VIN, located on the engine pad near the lower pulley is the final check. Because a number of restamps exist, it is important to piece together all of the information to make sure everything is accurate. The block code is a two-digit number until 1979 on Pontiac engines (three-digits after 1979). Immediately above the code is the engine unit number, which is either six or seven characters. Remember, these numbers have nothing to do with the VIN. Block codes beginning with “W” are manual transmission vehicles and “Y” codes are for automatics. However, there are always exceptions to this rule. In 1970, Pontiac revised the motor-mount bosses in the Firebird blocks to have five mounting holes; not all of them were tapped. The exception is the 1978 and 1979 400 blocks. They did not have the rear part of the motor mount openings at all. 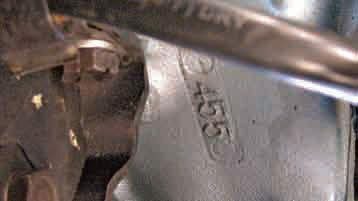 The Firebirds that came equipped with the 403 Oldsmobile engine have the VIN and casting number in a different location. The VIN is located on the driver’s side of the block front just below the head and behind the power steering. The casting number is on the top of the engine just behind the oil filler tube. In 1979 the Olds engine code was placed on the driver-side rocker cover on a bar-coded label. Few other engines enjoyed more interchangeability than the Pontiac V-8. Heads, intakes, internals, and exhaust manifolds swap between the 350, 400, and 455 with relative ease, but that also means a lot of engines have a lot of non-original parts on them. 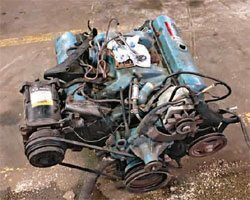 Before you endeavor to rebuild your Pontiac engine, you need to honestly and accurately assess your mechanical ability, workshop space, and necessary tools. Most mechanically inclined car owners can competently rebuild an engine. Certainly, if it’s your first and you take a thorough and methodical approach, you can rebuild the engine yourself. Of course, the machining work, crank straightening, or any other necessary machine work needs to be handled by a qualified machine shop. But don’t kid yourself; it takes exceptional attention to detail and procedures must be followed methodically. You must take the type of engine into consideration before you decide to do the rebuild yourself. Rare collector engines deserve professional rebuilds by shops. In my estimation, a professional should rebuild exceptionally rare and valuable engines, such as the 400 RA III, 400 RAIV, and 455 Super Duty. 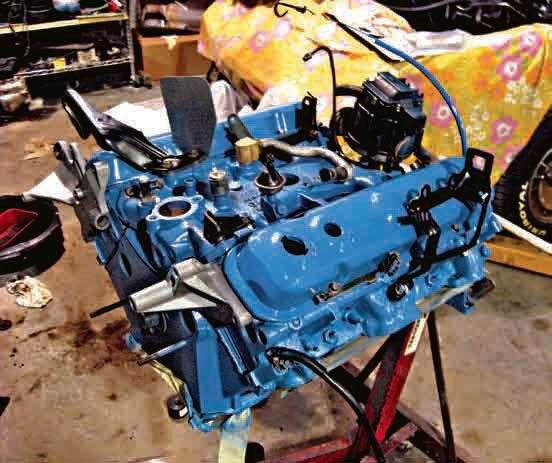 If you’re a skilled engine builder and you’ve rebuilt several Pontiac V-8 engines (Firebirds, GTOs, or other Pontiacs), you have the experience and the knowledge to tackle virtually any engine-rebuilding project. 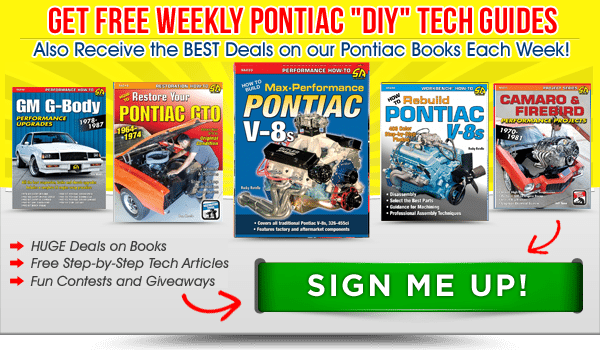 However, if you’ve never rebuilt an engine or you’ve rebuilt only one engine, the learning curve is steep and the challenge is great because you need to learn a lot about the specific procedures, parts, and requirements of Pontiac engines. If this sounds like you, I suggest that you rely on a professional engine shop with specific experience in rebuilding Pontiac V-8 engines. The engine in your Pontiac Firebird or Trans Am may not be original. When engines failed under warranty in a Firebird or Trans Am, service replacement engines were installed in their place. That means the block numbers do not match the VIN numbers. Many Firebird and Trans Am V-8 cars were driven very aggressively through the years; after all, they were muscle cars. When these cars were used and abused, engines could be over-revved, worn out, or just neglected, which led to an engine failure. When this was the case, many of the engines were swapped out for something non-original. You need to properly identify the engine under the hood before you start the rebuilding process. Once you have accurately identified the engine, you should conduct a thorough inspection and then evaluate your ability to meet the requirements of the engine-building process. Rebuilding the stock or existing Firebird or Trans Am engine is not the only option. If the car is going to be a rarely driven show car, and you have a numbers-matching engine, you should have the engine rebuilt and installed. On the other hand, you can select a complete long-block crate engine that comes with a warranty. It’s an excellent option if you’re restoring a car as a weekend or daily driver and you don’t want to pile up miles on the original engine. You can put theoriginal or stock engine on an engine stand and store it in your garage. And at a later date, it can be rebuilt and re-installed in the car. Sometimes it’s readily apparent that the engine needs to be rebuilt and sometimes it’s not. Obvious evidence is blue smoke from the exhaust, knocking sounds, white smoke from the exhaust, or a seized engine. All are signs that a rebuild is necessary. Having a shop perform a compression test or leak-down test can also determine whether your engine needs a rebuild. Sometimes an engine runs perfectly well but has low compression because it is worn out and is simply in need of an overhaul. 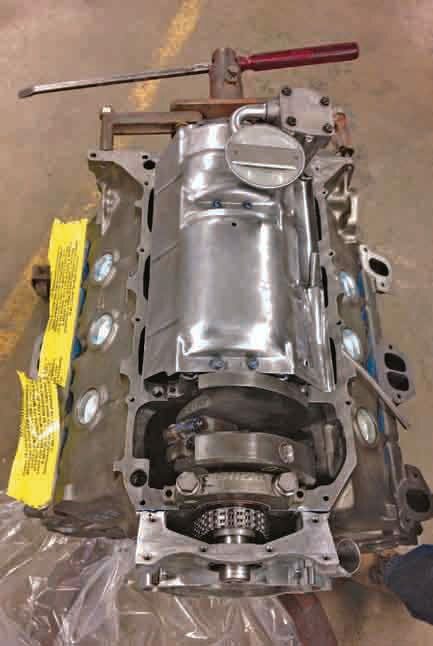 Rebuilding an engine requires expertise and specialty tools that cost beyond what a quality engine rebuild would cost. Pontiac engines are best built by shops that specialize in Pontiacs because of their unique characteristics. If you choose to have a professional shop rebuild your Pontiac or Oldsmobile V-8 in your Firebird, you also receive a warranty on your rebuild, which can be invaluable should there be a failure. Failures do occur and not always due to the shop’s work. Parts today are sometimes of dubious quality and bad batches do occur. If a small part fails and causes a failure, the machine shop bears the responsibility. Even a small part failure can have catastrophic consequences. Some things are just worth paying for. Because all Pontiac engines look pretty much the same, it is important to be able to identify the particular engine that is in your Firebird. However, do not rely solely on the castingnumber as proof of having the original engine simply because the numbers match. 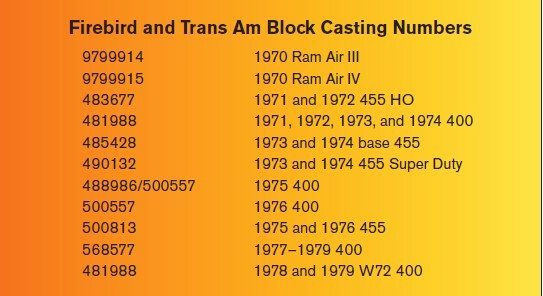 The block casting number is just the first step to verification. It is located on the passenger’s side of the block behind the right head. This Ram Air III 400 block has been dismantled and prepared for the machine shop to start the rebuilding process. The Ram Air III engine was used for the 1970 model year only. 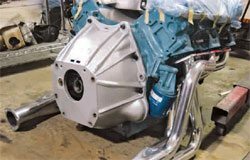 The Turbocharged 301 is a lightweight cast engine, which was not particularly durable. Most other Pontiac engines do not interchange their parts with this engine. The parts availability for the 301 is almost nonexistent. Before you embark on an engine rebuild, I advise you to locate as many common rebuild parts as possible. This will shorten the shop time while they wait for parts. I also suggest you find a piston manufacturer that is willing to custom build a set of pistons in advance for you. It is not far-fetched to think that your 301 will need pistons. The only question is what size overbore will your engine require? The machine shop will not be able to give you that answer until disassembly at a minimum, but you may have to wait until they bore the block. At the midway point in the rebuild process, you need to remove the rotating assembly and cam from the block. 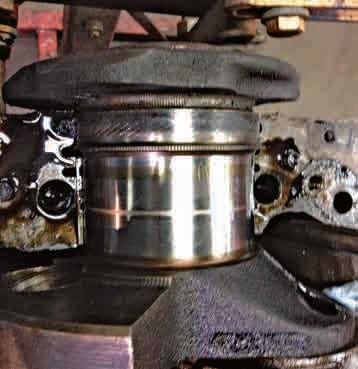 The main bearing caps need to measured and inspected for oil starvation and excessive wear or any damage. 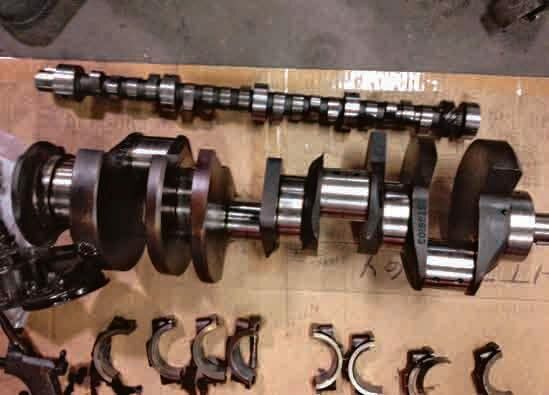 The connecting rods can be Magnafluxed and reused, but if you’re going through the rebuild process, I recommend installing new rods. The crankshaft journals should be measured with a micrometer to see if they are within spec or need machining. And the crank needs to be measured for run out. Pontiac engines have their displacement cast into the side of the block as this 428 shows. The 428 was never available in the Firebird lineup. This casting indicates a 455 block, which had a long and illustrious life in Firebirds and Trans Ams. Pontiac installed the 7-liter engine from 1971 to 1976. The intake, valley pan, and valvecovers have been removed so you can see the valley and valvetrain. Also visible are the stamped-steel standard-ratio roller rockers. This is another subtle upgrade that fits under the stock valvecovers. Roller rockers provide less resistance, which means that the engine has less friction. Less friction means more horsepower. Using a roller cam, roller timing chain, and roller rocker arms are all upgrades that are not visible when assembled. When you remove the rotating assembly from the block, you need to closely inspect the block for core shift, cracks on the deck area, and any cracks or damage around the lifter area. The piston and rod in this particular case seems to be in good shape so the engine didn’t suffer catastrophic damage. However, the cylinder bore has some scuffing and scoring. The rod bearings and caps attach at the rear of the crankshaft. The rear main seal also is installed here. This engine has been professionally rebuilt. It has been flipped over on the engine stand, and the windage tray and oil pump have been installed. The basic Pontiac block is a robust piece of iron. The block has the same exterior dimensions whether it is a 326, 350, 389, 400, 428, or a 455. The bore (size of the piston holes in the block) and stroke (crankshaft) determine the cubic-inch displacement. Almost all parts interchange among the different engines. For example, you can install 400 6X heads on a 350 and vice versa. The 1970 and up Firebird engines received a different motor-mounting boss. Pontiac engines really were not much about flash but more about the performance. Restoring the engine requires attention to detail. Pontiac changed the color of the engines several times. The 1970 Ram Air III and IV engines had chromed valvecovers. The later 1977–1979 W72 engines used poorly chromed valvecovers. The SD 455 engines used engine-colored valvecovers and only added a decal to the left side of the valvecover behind the oil filler cap. The 1971–1973s used Pontiac Blue non-metallic. Late 1973 and 1974s used Pontiac Blue. The 1975– 1977s used Pontiac Blue Metallic, and the 1978–1981s used GM Corporate Blue. All of these paints are available from Ames Performance Engineering. Making the decision to rebuild your engine rather than replace it depends on several factors. Because Pontiac no longer exists, there are no factory-fresh crate engines that other manufacturers support. Instead you have to rely on specialty rebuilders or the aftermarket, which produces blocks and heads of varying sizes and configurations. If your Firebird has a numbers- matching engine, it would be wise to rebuild it. If you are planning to drive your Firebird and run it hard, it may be a good idea to consider storing the numbers-matching engine and purchase another Pontiac engine to rebuild. Or you can go the resto-mod route by installing a Chevrolet or LS engine. The scope of this book does not cover resto-mods. Numerous options are available for building an engine internally for performance enhancements, but that can still remain stock appearing from the outside. Stroker kits are a popular upgrade that increase power but maintain anonymity. If your Firebird does not have its original engine, you have to decide if you want a correct engine or an upgrade. A correct engine is the original-displacement engine with the correctly coded block and heads that originally came with your car. In addition, the engine component dates must fall within the two to three months before the build date of your car. It may show a different VIN or be a service replacement block, but other than that, it would be the same engine originally installed in your car. Any other type of replacement engine is not considered a numbers-matching engine. It is not uncommon to find stroker 400-cior 455 engines residing in Firebird engine compartments. The whole process of rebuilding an engine is time consuming and tedious. The good news is that most of the attaching hardware is rarely rusted because oil leaks through the years have kept everything well lubricated. Removing the radiator and fan components is covered in Chapter 13 so I will continue from there. It is necessary to disconnect all wires that attach to the engine. All hoses must be disconnected. Engine oil should be drained, but the oil filter left in place. Remove the A/C compressor (if equipped) and put it to the side. Remove the power steering pump and the steering box hoses. Disconnect the fuel line feed at the fuel pump and plug it to prevent gas spillage. Disconnect the head pipes at the exhaust manifolds. Remove the motor-mount bolts. Remove the transmission bellhousing bolts. If equipped with an automatic transmission, remove the inspection plate and remove the torque converter bolts. Now the engine is ready to remove. 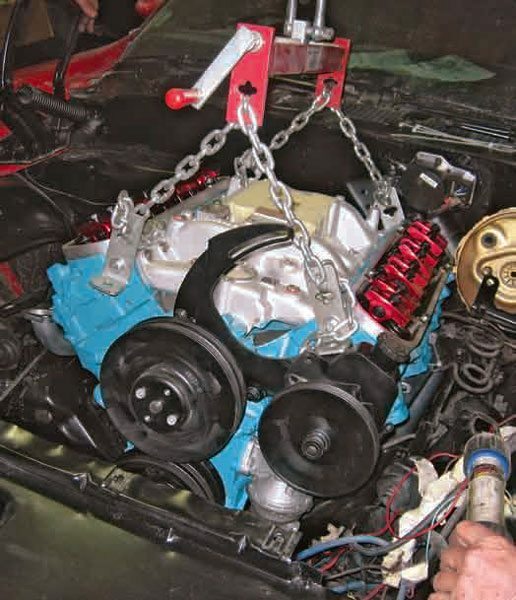 Using an engine crane, attach a chain to the front eye on the water pump and to the rear of the intake manifold. This is not the only way to attach the engine to the crane; suitable locations may be available at the front and rear of the engine. Another alternative is to use a plate that is designed to bolt to the intake manifold where the carburetor attaches. Lift the engine using the engine crane jack. It may be necessary to pull the engine forward to clear the transmission input shaft. 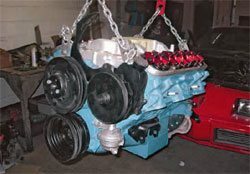 An alternative process is to remove the transmission before removing the engine. Removal of the engine is not a difficult process, but it takes some time and work. Before you start, disconnect the battery and place it in storage. You will find many connectors to disconnect: coolant hoses, transmission lines, engine accessories, vacuum lines, fuel lines, and the transmission. 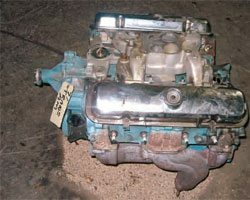 I recommend removing or at least disconnecting the transmission when removing the engine. Removing the engine with the transmission attached is much more difficult, increases the opportunity for damages to the car and the transmission, and usually is very messy. Disconnect throttle linkage, kick-down linkage (if equipped), and shaker solenoid actuator if equipped). The throttle linkage is held on with a washer and cotter pin. The kick-down linkage pops off at the end and is held in at the retaining bracket with a spring clip. Use long-nose pliers to compress the spring clips and then push the cable through the bracket. Remove the shaker solenoid actuator with an open-end wrench. It has a single connector to disconnect from the harness. Install the engine onto an engine stand while you’re rebuilding it. Once the SD 455 is removed, it’s ready to be placed on a four-wheel engine dolly. You can find one through the Internet for less than $100. If you want the machine shop to mill the heads and port match, you need to send the intake and exhaust manifolds; they need to match each port to create a smoother flow of air. 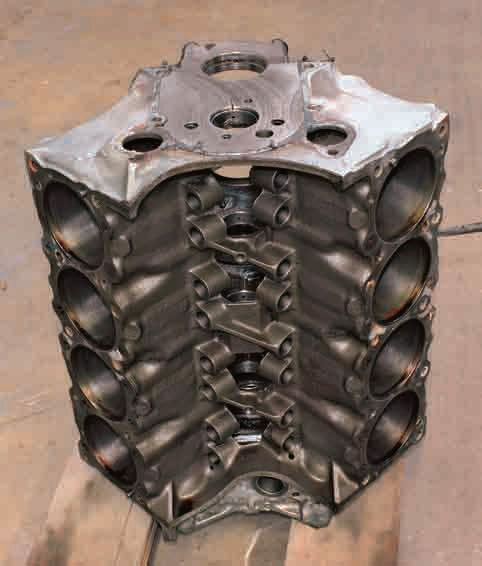 Whenever a head is milled, it sits lower, which, in turn, makes the intake manifold not sit properly on the head-mating surface unless it is also modified. Pontiac engines make their power in the head so spending the money to have the heads ported and polished is well worth it. Late 1970s 6x heads can be made to flow as well as Super Duty heads. 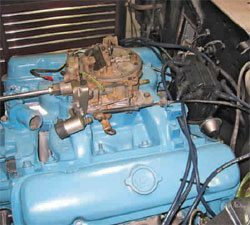 Pontiac engines were painted many different shades of blue throughout the years. The stock Pontiac blue was used to paint this 400 in a booth. This is more of a custom application than the traditional rattle-can approach. The paint used is an automotive-grade base coat/clear coat just like that used on the body panels. Before the engine is reinstalled, clean and repaint the hardware that was removed. This particular engine is a W72 numbers-matching 400 engine out of a 1979 Trans Am. The engine has been rebuilt, the compression raised to 9.5:1, and the heads and aftermarket Edelbrock intake have been ported and polished along with adding 1.65:1 Harland rockers. This allowed the 220-hp powerplant to make more than 350 hp at the rear wheels on the dyno. The use of this type of rocker arm usually necessitates the taller valvecovers. Once the engine is back from the machine shop, it requires a degreasing to prep it for paint. The engine may appear clean, but it has a film of oil from the processes involved in rebuilding and reassembly. Once you have cleaned the surface and removed all oil residue, use a high-temperature primer. Pay particular attention to the center exhaust ports; paint burns here first because of the configuration of the port. You can use either automotive-grade paint applied in a booth or rattle-can paint. 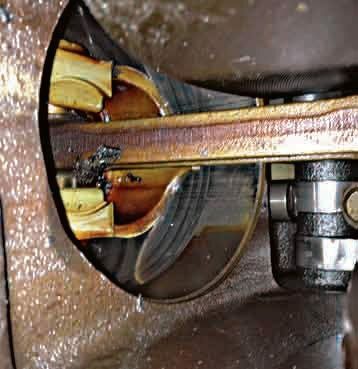 If you have a manual transmission, it is a good idea to install the flywheel, clutch, clutch fork, throwout bearing, and bellhousing before reinstalling. Tubular ceramic-coated headers are a great benefit for achieving additional power. Ceramic coatings help reduce the engine compartment underhood temperatures. Headers can add as much as 40 hp to the rear wheels when connected to a proper exhaust system. I highly recommend Doug’s headers as they fit well to clear all of the 4-speed linkages and have provisions for air-conditioning brackets. This engine has been placed on a hoist and rolled into position. Installing the engine is much easier as a two-person project so I recommend having someone operate the engine hoist while another person guides the engine into place and aligns the motor mounts. Be careful and be patient. You don’t want the engine to swing too much and bang up the firewall, power steering pump, brake booster, or any other parts. In many cases, you need to move the engine into position inch by inch. Once you have it in position and have the motor-mount bolts threaded, you can start connecting the throttle linkage, coolant hoses, electrical harness, and all the other parts. The key to removal and installation of your engine is patience and organization. Take pictures of where things are connected prior to removing them. You may not get your engine back from the rebuilder for months and you may not remember every item, especially to how hoses and wires were routed. I recommend replacing all hoses, mounts, and clamps now. One failure could cause internal damage to the engine or, at a minimum, a mess that is not easy to clean up.